I'm super excited to show you my absolute favorite foundations and the shades that I recommend for tan skin like mine. I did my first installment of this series several years ago and it's still one of my most popular posts. If you're looking for new foundations or you're trying to find your shade and you're similar to my coloring, this video is for you! 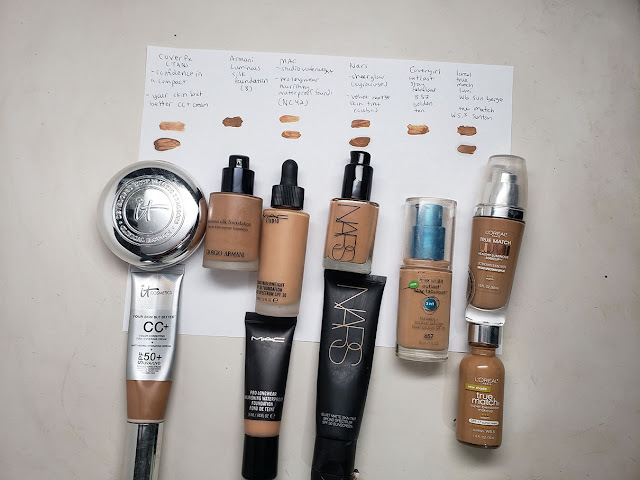 I tried to pick a range of foundations, from drug store to high end. I'm a fan of medium coverage, dewy finish. But I did include a couple of full coverage and matte options. Here's a paper swatch of the foundations as well as the actual shade names. Double click the pic to expand it. I prefer foundation with a warm tone, with a mix of yellow and brown. I avoid anything with a beige undertone or beige in the title because I know it will be too cool for my tan skin tone. Sorry for my chicken scratch handwriting. Do you guys have any favorite foundations you'd like to recommend? Let me know in the comments below! 5 Month Post Partum and Baby Update - First Baby!